Riverside Farm is a venue that makes capturing the charm of a farm wedding easy for Rustic Vermont Wedding Photographers. Riverside Farm is the country’s most exclusive wedding venue, serving only a limited number of weddings each year. The location is home to a number of venue spaces, each venue set in a renovated barn. The grounds of the Riverside Farm and the barns that grace them are ideal for Rustic Vermont Wedding Photographers. This picture shows one couple’s barn wedding ceremony. In the background of the picture, bridesmaids stand at attention in maroon colored, knee length dresses. In their hands are bouquets of deep red roses, mixed with flowers in hues of pure white and bold yellow. The attention of the bridesmaids and the few guests who can be seen is on the front of the space, where the ceremony will soon begin. 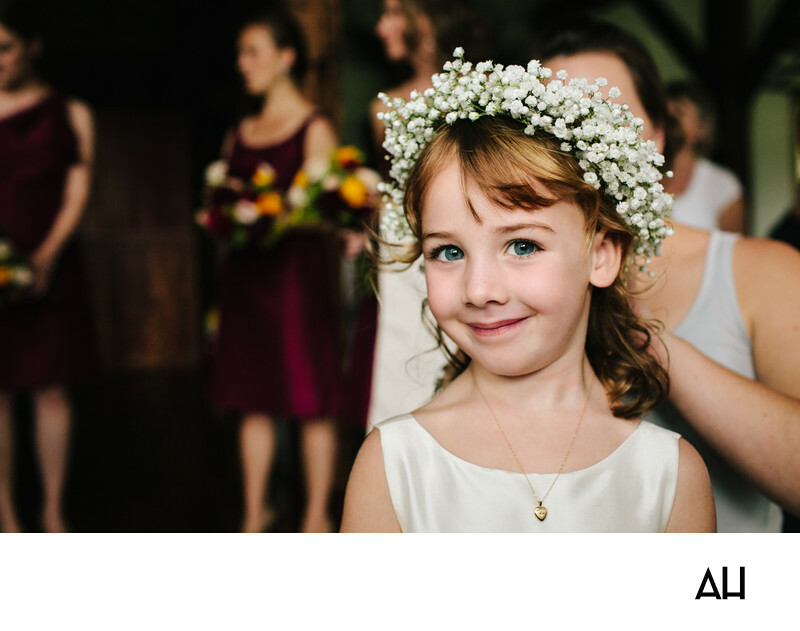 All eyes will soon be on bride and groom, but for now this little flower girl is stealing the show. The little girl is dress all in white, and her big blue eyes sparkle with excitement at her part in the day’s festivities. Behind her, her mother pins the wreath of baby’s breath that sit in her curled blonde hair. Around her neck is a tiny, gold locket. This was a gift given to her by the bride as a thank you for helping make the wedding day an extra special occasion. The little girl’s expression is bright and happy, a symbol of the pure joy that will fill the room as the ceremony begins.